Last night Breitbart did a fact check on one point of Joseph Kennedy‘s speech that I thought was rather interesting. What is now Fall River was first established in the 1600s by English settlers who were not “immigrants” but colonists. A native-born family, the Bordens ran a mill in what became the town for generations before and after the American revolution. Industrialization began when Col. Joseph Durfee, a native-born Revolutionary War hero built the first factory in 1811. Later, at the end of the 19th Century a wave of immigrants swelled the town’s population. Immigrants, however, never made up a majority of the population of Bristol County, where Fall River lies, even at their early 20th Century peak. The Democrats are so busy trying to win the votes of people they hope to make citizens, they are misstating history. One might wonder if some of the groups of immigrants coming into this country now are immigrants or colonists. First a few general comments. If you watched the State of the Union speech by President Trump last night, there were some things you might have noticed. First of all, the State of the Union speech has become a forum for Congressmen and women to act like children. If you are in Congress, why would you not stand when someone suggests that standing for our national anthem is appropriate? If you do not want to stand for our national anthem, what are you doing in Congress? There were other similar moments that called for unity, but that particular one really should be non-partisan. Charles Edward Montague, English novelist and essayist (1867-1928), one stated, “There is no limit to what a man can do so long as he does not care a straw who gets the credit for it.” It is time we realized that as a country. There were some very unifying parts of the speech. Unfortunately there are also members of Congress who prefer divisiveness. …We slashed the business tax rate from 35 percent all the way down to 21 percent, so American companies can compete and win against anyone in the world. These changes alone are estimated to increase average family income by more than $4,000. The economic turnaround created by de-regulation and tax cuts has impacted all working Americans. Lower drug prices are needed. Access to experimental treatments will also be a good thing. This is a good starting place. If Congress can debate without acting like five-year olds, something might actually get accomplished. This was a very unifying speech, whether or not you like President Trump. It is time to put petty personalities behind us and work together. It would be nice if this speech was the beginning of that unity. Scott Johnson at Power Line posted an article today about the testimony of Glenn Simpson before Congress. The testimony of Glenn Simpson, the founder of Fusion GPS, was released by Democrat, Sen. Dianne Feinstein of California without the consent of Republican members of the Senate Judiciary Committee. …Edward Jay Epstein is the author, most recently, of How America Lost Its Secrets: Edward Snowden, the Man and the Theft and the City Journal column “A question of motive.” Ed’s long career has centered on issues of intelligence and counterintelligence with respect to which the late CIA head of counterintelligence, James Jesus Angleton, turned out to be a mentor to Ed as he navigated his path in that world. I have read Simpson’s testimony. I’ve also done research into Christopher Steele, who I believe has his own agenda. Steele’s dossier Sources A and B have to be assumed to be supplying curated information. Any former Russian intelligence officer, especially one still active in the Kremlin, would understand that supplying secret information to an intermediary for a former British intelligence officer would be the essence of espionage. That is how espionage is conducted through access agents or intermediaries. They would not be putting their lives at stake to pass this information on. A safer assumption is that they cleared the information with the FSB. If so, and I see no other alternative, it is curated information. Why would Russia be supplying curated information to the Clinton campaign? The simple answer is they expected Clinton to win and this would give them compromising Leverage over the new president. After all, it is also against American law to pay foreign officials to act corruptly. So if she won Hillary could be accused of the same thing that Trump is now accused of. It also adds to the bad image of American elections. So I believe the Russians were feeding both sides with slime, or trying to. And through the Clinton presidential campaign they succeeded beyond their wildest dreams. It seems as though a lot of people were placing heavy bets on a Clinton win. It is a shame that some of these bets caused them to do things that were against the law. It is interesting that the fact that it is against American law to pay foreign officials to act corruptly has not been brought up yet in the discussion of misbehavior during the 2016 presidential campaign. It seems as if the Clintons corrupt everyone they interact with. Breitbart posted an article today about some recent comments by Australian Prime Minister Malcolm Turnbull. It seems that the story the mainstream media is peddling that the election of President Trump has hurt America‘s image overseas may not be entirely true. U.S. President Donald Trump’s sweeping tax cuts combined with reforms in corporate regulation are benefiting the global economy, Australian Prime Minister Malcolm Turnbull said. Mr. Turnbull pointed to the International Monetary Fund’s strong predictions of global economic growth in the wake of the Trump tax cuts as testament to his economic drive. Speaking during a radio interview, Mr. Turnbull happily declared: “Donald Trump is delivering on economic leadership, that’s for sure” before outlining his own close personal relationship with the president. “You’ve only got to look at the IMF to see they regard the American tax cuts as being very pro-growth,” he said. “And, of course, because the US is such a big part of the global economy, that has lifted global growth forecasts as well. The article also quotes the Prime Minister reaffirming that America and Australia have a good relationship and would act as allies if either one were attacked. I think we need to realize that the leadership of President Trump both in America and around the world has achieved positive results. Victor Davis Hanson posted an article today at a website called American Greatness. It is an amazing article in that it lists all the activities of the anti-Trump people during President Trump’s first year in office. The article is appropriately named, “From Conspiracy Theories to Conspiracies.” As you read the article (I strongly suggest that you follow the link and read the entire article–my summary cannot do it justice), remember that the opposition to candidate (and later President) Trump came from Democrats and some Republicans. What better way to derail a presidency would there be than to allow a blank-check special counsel to search out alleged criminal activity on the part of the president? We have seen FBI Director James Comey confess that he deliberately leaked, likely illegally, confidential notes of a meeting with president Trump to the media, with the expressed intent of creating a “scandal” requiring a “special counsel”—a gambit that worked to perfection when Comey’s close friend, former FBI Director Robert Mueller was appointed. The FBI itself would have earlier trafficked in a fraudulent document funded by the Clinton campaign to “prove” Trump and his team were such dangers to the republic that they required surveillance under FISA court warrants and thus should surrender their constitutional rights of privacy. The ensuing surveillance, then, would be widely disseminated among Obama Administration officials, with the likely intent that names would be unmasked and leaked to the anti-Trump press—again, in efforts to discredit, first, the Trump campaign, and later the Trump transition and presidency. A top official of the prior Department of Justice would personally consult the authors of the smear dossier in efforts to ensure that its contents would become useful and known. It is totally scary that this has happened. Key officials of the prior government would likewise weigh in constantly to oppose the subsequent Trump agenda and demonize their own president. Samantha Power, Susan Rice, and Ben Rhodes would warn the country of the threats posed by their successor, but fail to disclose that they had previously requested to view FISA surveillance of the Trump team and to unmask the names of U.S. citizens which predictably soon appeared in media reports. Former Secretary of State John Kerry, according to the Jerusalem Post, assured a prominent Palestinian government leader, “that he should stay strong in his spirit and play for time, that he will not break and will not yield to President Trump’s demands.” Kerry reportedly further assured the Palestinian representative that the president may not be in White House for much longer and would likely not complete his first term. In sum, the former American secretary of state all but advised a foreign government that his own president is illegitimate and thus to be ignored or resisted in the remaining time before he is removed. If any of these efforts were undertaken in 2009 to subvert the presidency of Barack Obama popular outrage might well have led to criminal indictments. If Hollywood grandees had promised to do to Barack Obama what they boast doing to Donald Trump, the entire industry would have been discredited—or given the Obama investigatory treatment. Indeed, in many cases between 2009-2017, U.S. citizens the Obama Administration found noncompliant with its agendas became targets of the IRS for their political activity or monitored by the Justice Department. The latter included reporters from the Associated Press and James Rosen of Fox News. Many a journalist’s sources were prosecuted under the Espionage Act of 1917. In another case, a filmmaker had his parole revoked and was scapegoated and jailed to advance a false administration narrative about the death of four Americans in Benghazi. Still others were surveilled by using fraudulent documents to obtain FISA court orders. In contrast, unhinged conspiracy theorists, for example, might obsess yet again over the machinations of multibillionaire and leftist globalist bogeyman George Soros, and float wild yarns that he would fly to Davos to assure the global elite that he considers Trump “a danger to the world,” while reassuring them that the American president was “a purely temporary phenomenon that will disappear in 2020—or even sooner.” . . . It is becoming very obvious that some of the people in high government positions belong in jail. The question is whether or not they will go there. If equal justice under the law is truly one of our founding principles, it needs to be practiced at all times–regardless of the political consequence. One America News posted an article today about the impact of developing America’s oil resources. The Energy Information administration reports U.S. oil production reached almost 9.9 million barrels per day this month. So what is the impact of this? America i s exporting more than 1.7 million barrels per day of oil. Hopefully this will end some of our cozy relationships with tyrants who rule oil-producing countries in other parts of the world. Energy experts say the U.S. is on track to surpass Saudi Arabia in oil output this year, and rival Russia as the world’s energy giant. The article also notes that the increase in our oil exports give America an advantage in both international trade and diplomacy. There is a concern that the increased exports will cause fuel costs in America to rise, but the Trump administration believes that the deregulation of prices will prevent that from happening. Energy independence is a good thing. Being able to export oil you don’t need is an even better thing! “Dave” and “Mike” currently remain unknown. Congress has oversight responsibilities over the FBI and DOJ. It is time that they start making recommendations based on what they have learned. I am sure there are some junior members of both organizations who have not been involved in the chicanery that the senior members have engaged in who would be qualified for promotions. The fact that many of these people still have jobs is totally unbelievable. Theoretically, this is the week the infamous four-page memo detailing constitutional abuses by the Federal Bureau of Investigation (FBI) and Department of Justice (DOJ) will be released. The battle over the release of that memo and what is supposedly in it continues. On Thursday, Sharyl Attkisson posted an article at The Hill explaining some aspects of the battle over the release of the memo. Ms. Attkisson formerly worked for CBS. She resigned from CBS after her investigative reporting was getting too close to the truth. Her reporting on the Fast and Furious scandal received an Emmy Award. What happens when federal agencies accused of possible wrongdoing also control the alleged evidence against them? What happens when they’re the ones in charge of who inside their agencies — or connected to them — ultimately gets investigated and possibly charged? …First, there’s the alleged improper use of politically funded opposition research to justify secret warrants to spy on U.S. citizens for political purposes. It is becoming obvious that America citizens had their Fourth Amendment rights violated. The questions is whether of not anyone is going to be held accountable. The FBI’s complaint carries a note of irony considering the agency has notoriously stonewalled Congress. Even when finally agreeing to provide requested documents, the Department of Justice uses the documents’ classified nature to severely restrict who can see them — even among members of Congress who possess the appropriate security clearance. Members who wish to view the documents must report to special locations during prescribed hours in the presence of Department of Justice minders who supervise them as they’re permitted to take handwritten notes only (you know, like the 1960s). What most people don’t know is that the FBI and Department of Justice already know exactly what Congressional investigators have flagged in the documents they’ve reviewed, because three weeks ago the Senate Judiciary Committee sent its own summary memo to FBI Director Christopher Wray and Department of Justice Deputy Attorney General Rod Rosenstein. The committee also referred to the Department of Justice a recommendation for possible charges against the author of the political opposition research file, the so-called Trump dossier: Christopher Steele. Meanwhile, the Department of Justice has officially warned the House Intelligence Committee not to release its memo. It’s like the possible defendant in a criminal trial threatening prosecutors for having the audacity to reveal alleged evidence to the judge and jury. The memo is supposed to be released next week–mid week–after the President’s State of the Union speech. There have been some suggestions that he read the memo instead of giving the speech. That is not an idea I support, but I understand why some people might suggest it. The scandals abound. Who actually authorized the sale of uranium to Russia? Who decided Hillary Clinton would not be charged with a crime? What was the basis for a FISA warrant allowing spying on the Trump campaign and transition team? At what point did the upper echelon of the FBI and DOJ become political? Are the FBI and the DOJ subject to the U.S. Constitution? Hopefully, we will have the answers to at least some of these questions by the end of next week. If the answers are what they seem to be, some of our government needs to answer some very pointed questions. No, this isn’t about memos or Russians. This is about the false alarm in Hawaii that must have been extremely frightening to the residents and tourists. 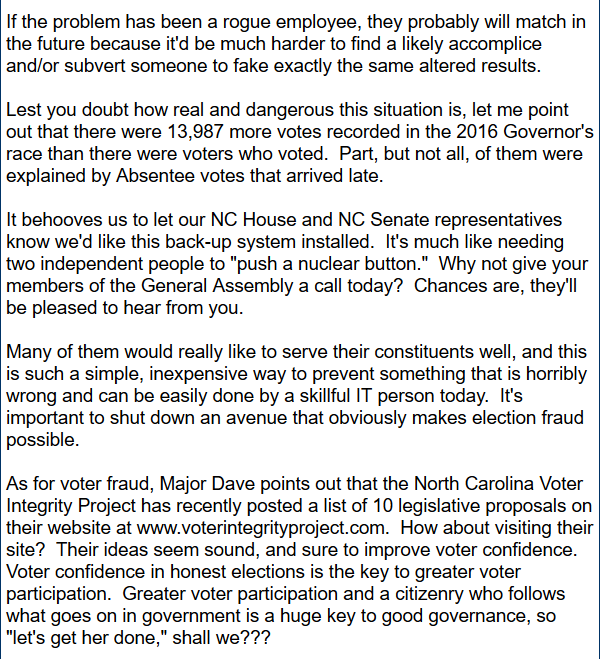 John Hinderaker posted an article at Power Line yesterday about the investigation into the incident. The employee who sent the false missile alert in Hawaii, causing widespread panic and confusion, is refusing to cooperate with the investigation, a federal official said Thursday. One really wonders what went on here. A person I know who was in Hawaii at the time said that she thought it was odd that the civil defense sirens did not go off when the alert came over her cell phone. Stay tuned. If the results of this investigation are made public, they may be very interesting. The offending employee has not been identified. Here is a wild guess: the employee who “pushed the wrong button” is a fanatical anti-Trump Democrat who believed that causing hysteria over a presumed North Korean missile attack would somehow make the president look bad. If that guess is incorrect, maybe the anonymous employee should start cooperating with the investigation. Is there a better explanation? Yesterday John Hinderaker posted an article at Power Line about recent statements made by former Secretary of State John Kerry to Hussein Agha, a close associate of PA President Mahmoud Abbas. …According to Kerry, Trump will not remain in office for a long time. It was reported that Kerry said that within a year there was a good chance that Trump would not be in the White House. …He surprised his interlocutor by saying he was seriously considering running for president in 2020. When asked about his advanced age, he said he was not much older than Trump and would not have an age problem. …In a report on the conversation, Agha said that Kerry appears to be “crazy about things,” very energetic, and someone who is yearning to help realize the dream of peace between Israelis and Palestinians. As a country we have not enforced the Logan Act; however, this does seem a bit over the top. If John Kerry decides to run for President in 2020, he will be competing against Bernie Sanders, Elizabeth Warren and Kamala Harris. I am not sure there is enough popcorn in the world to watch that. Fox News is reporting today that the Department of Justice has recovered more than 50,000 text messages sent between FBI officials Peter Strzok and Lisa Page during the time period December 14, 2016 and May 17, 2017. Fox News has learned from U.S. government officials that the inspector general recovered the texts by taking possession of “at least four” phones belonging to Strzok and Page. The fact that the inspector general recovered the texts and took possession of the phones gives me hope that what is being reported is information that has not been altered in any way. In one text exchange, Strzok and Page spoke of a “secret society” within the Department of Justice and the FBI the day after Trump’s victory, according to two lawmakers with knowledge of the messages. “We learned today about information that in the immediate aftermath of [Trump’s] election, that there may have been a secret society of folks within the Department of Justice and the FBI — to include Page and Strzok — that would be working against him,” Rep. John Ratcliffe, R-Texas, said Monday on Fox News. In another infamous message, Strzok appeared to make reference to an “insurance policy” against a Trump win. “I want to believe the path you threw out for consideration in Andy’s office — that there’s no way he gets elected — but I’m afraid we can’t take that risk. It’s like an insurance policy in the unlikely event you die before you’re 40…” he wrote. I would like to remind Congress that according to a statement made in 1913 by United States Supreme Court Justice Louis Brandeis, “Sunlight is the best disinfectant.” The public needs to know what the upper levels of the Department of Justice and Federal Bureau of Investigation have been up to in recent years. We need to #ReleaseTheMemo and we also need to see what Strzok and Page were planning as an insurance policy and with their ‘secret society.’ Healthy representative republics don’t have secret societies attempting to undo a valid election. It is amazing to me that these two people still have jobs. PJ Media posted an article yesterday about emails between Lisa Page and Peter Strzok which have recently been turned over to Congress. At this point I would also like to note that the emails between the key dates of December 14, 2017 to May 17, 2017 are missing. However, the emails that were turned over are disturbing. If there is evidence that proves any of this true (and it seems as if there is), then people need to go to jail and the entire upper echelon of the Justice Department and FBI need to be fired (at the very least). These activities by the Department of Justice and the FBI have totally undermined the credibility of the organizations. I will admit that I became suspicious of the politicization of the Justice Department when the voter intimidation case involving the New Black Panthers was dismissed (article here). There is always danger in any government that a few people will acquire more power than they can handle and misuse that power. I believe we are watching an unmasking of misuse of government power in the final months of the Obama Administration. This needs to be dealt with quickly and decisively. It is also becoming obvious that more controls are needed on the FISA laws. Do you ever wonder if these people think before they speak? The Russia thing is dead, yet he is still trying to bring it back to life! The Washington Examiner posted an article yesterday about missing texts in an ongoing Congressional investigation. Investigators in both House and Senate were stunned late Friday when, receiving a batch of newly-released texts between FBI officials Peter Strzok and Lisa Page, they also received notice from the bureau that the FBI “failed to preserve” Strzok-Page messages from December 14, 2016 through May 17, 2017. Isn’t it amazing that the texts between those two people during that time period have disappeared? On Saturday, Sen. Johnson sent a letter to FBI director Christopher Wray with a series of questions about the missing texts. Does the FBI have records of any other communications between Strzok and Page? What texts has the FBI produced to the inspector general? How extensive was the alleged glitch that allegedly resulted in the lost texts? 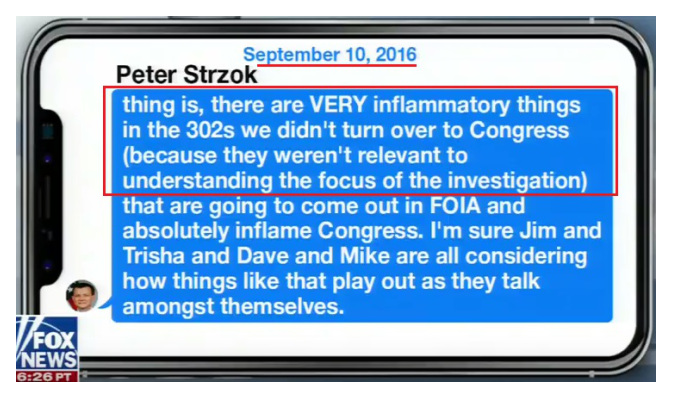 That is an apparent reference to instances in the texts in which Strzok and Page told each other that they were switching to iMessage for further conversation, suggesting they might have moved their discussion of sensitive topics from their government-issued Samsung devices to private Apple devices. “Very suspicious,” said one investigator about the news. “Hard to believe,” said another. There are already a lot of Americans who believe that Washington is totally corrupt–on both sides of the aisle. Incidents like this further that belief. If Congress, the FBI, and the DOJ have any intention of restoring their credibility with the American people, they need to find these messages, finish their investigation, and get on with the business of government. 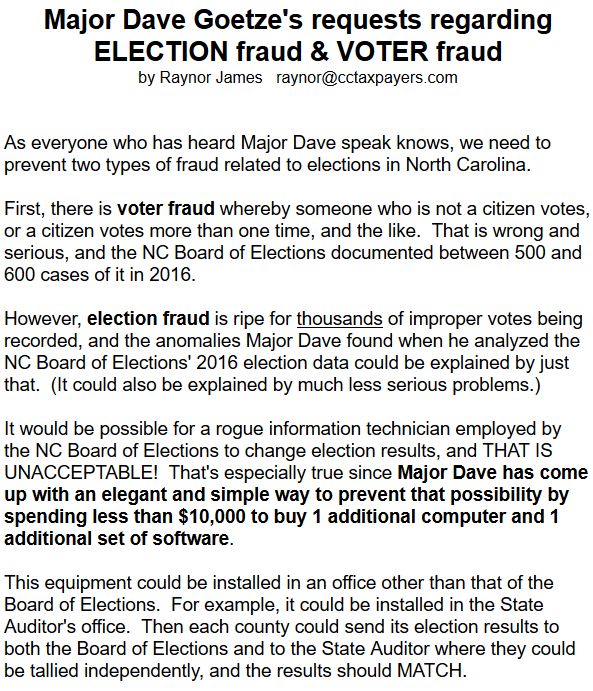 All of the information in this article has been taken from an article posted at The Conservative Treehouse yesterday. 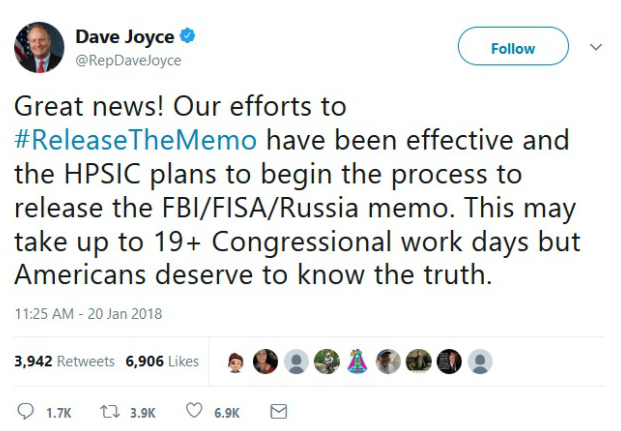 The #ReleaseTheMemo movement has been successful. The article explains what is involved in releasing the memo and the steps that are necessary in the process in order to comply with the law. Once the House Intelligence Committee votes to declassify the four-page memo, the White House, National Security Adviser (H.R. McMaster) and National Security Council will have five days to review the content. The White House will likely have a brief review by the NSC and the Office of Legal Counsel of the content, and then issue approval for the release. …Secondly, while it might seem like a good idea for President Trump to declassify the Nunes memo, if given by the Intel Committee, it would not be prudent to do so. Within this classified document Donald Trump is the subject of adverse action outlined therein. …Therefore the best route as constructed by Nunes and Goodlatte would be for the House to vote to declassify, pass on to the Executive for review, then President Trump grants approval for the request of the House (legislative branch). By law, all attempts by the legislative branch to declassify intelligence information must be given to the executive branch for review in advance of release. This is because the executive branch needs to see if any current intelligence operations might be compromised by information not known to the legislative branch. The National Security Council and any impacted offices of the intelligence information (CIA, NSA, FBI, DOJ, U.S. DoS, DOD, etc.) review, provide opinion, and sign off prior to executive approval and release. It is not just this declassification that goes through this process, all declassification goes through this process. In this example, presumably, the President has no adverse reason to block the declassification request and it is likely all approvals will happen quite quickly. After the White House approves of the HPSCI request, the Memo then becomes public. That’s when Democrats will attack the memo as being authored and misrepresented by Chairman Devin Nunes. This is the politics. We need to remember a few things here. First of all, the Democrats DO NOT want this memo released. It is becoming obvious that there are things in the memo that make the Democratic party look really bad–such as using the government to spy on political opponents. Watergate was simply attempted spying and people went to jail. This allegedly was using government agencies to spy–many people should go to jail. Secondly, if and when the memo is released, the Democrats will do everything they can to discredit it. However, at some point this month, the Inspector General’s report is due out, and I suspect that will confirm much (if not all) of what is in the memo. If/when this happens (highly likely it will), Chairman Nunes will then request the entire House of Representatives be given the opportunity to see the underlying FISA documentation that led to the summary. The underlying FISA documentation likely includes the DOJ/FBI FISA application as presented to the FISA court; again, likely to include the “Clinton/Steele Dossier”. 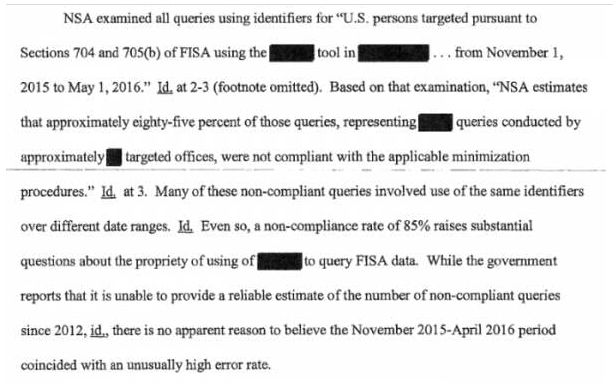 Additionally, the FISA-702 raw data will include the FBI “searches” on Trump officials that led to the upstream collection of information and the subsequent “unmasking” of Trump officials. Releasing the underlying FISA documentation -that proves the Nunes FISA memo- will likely follow a similar path as the Nunes memo itself. Again, this is a process, and within each of these processes there are revelations as to the scope of the corruption and conspiracy. In April and May 2017 Director of National Intelligence Dan Coats, and NSA Director Admiral Rogers, began assembling a pathway for Devin Nunes to climb out of that intelligence box. ODNI Dan Coats declassified the FISA Court opinion, and that opened the door for Horowitz, Grassley, Goodlatte and Nunes to question the content therein that circled the unlawful action of the DOJ and FBI. Where we are today is a step in the investigative process that is an outcome of months of work by Coats, Rogers and Horowitz to extract Chairman Devin Nunes and bring all prior DOJ and FBI corruption to the surface. I strongly suggest that you follow the link to read the entire article. The author is amazingly detailed in his research and lists his various sources at the end of the article. Look for the Democrats to stage a major distraction about the time the memo is released. It may be another government shutdown or it may be some sort of march or filibuster. Based on what I have heard, the Democrats will do almost anything to keep this memo off of the front page of the news. Stay tuned.